New GameReviewPad Content Type: Kickstart? At GameReviewPad, supporting development process of independent games is incredibly important, so this is why I am proud to introduce Kickstart? as the new GameReviewPad content type. Providing coverage of games from beginning to end is extremely necessary, this includes providing coverage for new kickstarters trying to find their game. 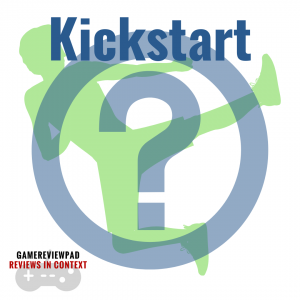 Why is it called “Kickstart?”? It’s called Kickstart? because coverage of kickstarters will not be endorsements, but informational posts letting the readers know of a kickstarter that they should check out and decide for themselves whether it’s worth funding. It is incredibly important to note non-affiliation with kickstarters, as well as not trying to tell you what to do with your money. The logo may change slightly, but this will be the main site logo for Kickstart? coverage. The instagram version may change to give more real estate for the game name. Thanks for reading and supporting GameReviewPad, as the site continues to evolve in this ever-changing video game industry.